As LED becomes popular for indoor lighting solutions, cost structure has become a critical factor. A simple flyback converter is one of best candidates for low-cost LED lighting. However, switching power supplies for LED lighting still requires high-power factor and high system efficiency. The latest power devices are essential to overcome this challenge. This article introduces a new integrated controller and high-performance high-voltage super-junction MOSFET as an LED lighting solution. These products enable both simple structure and high performance. Fairchild’s FL7732 highly integrated pulse width modulation (PWM) controller provides several features to enhance the performance of low-power flyback converters. The patented topology of FL7732 enables the most simplified circuit design, especially for LED lighting applications. By using a single-stage topology with primary-side regulation, an LED lighting board can be implemented with the fewest external components and minimized cost without requiring an input bulk capacitor and feedback circuitry. To implement high power factor and low total harmonic distortion (THD), constant on-time control is utilized with an external capacitor. Figure 1 shows typical application circuit of FL7732 controller. Generally, discontinuous conduction mode (DCM) operation is preferred for primary-side regulation because it allows better output regulation. The operating frequency is proportionally changed by the output voltage to guarantee DCM operation with higher efficiency and simpler design. To maintain DCM in the wide range of output voltage, frequency is linearly changed by output voltage in linear frequency control. The output voltage is detected by auxiliary winding and resistive divider connected to VS pin. When output voltage decreases, secondary diode conduction time is increased and the linear frequency control feature makes switching period longer to guarantee converter remains DCM operation over wide output voltage range. The frequency control also lowers primary rms current that results in better power efficiency in the full load condition. The FL7732 also provides the protection functions such as open LED, short LED and over-temperature protection. One important feature is that the current limit level is automatically reduced to minimize the output current and protect external components in the short LED condition. FL7732 also has frequency hopping function in the oscillator for better electromagnetic interference (EMI) performance. In high-voltage MOSFET technologies, the most remarkable achievement for on-resistance reduction is a charge-balance technology. This technology, adopted from super-junction structure, has a deep P-type, pillar-like body structure as compared to the popular structure of conventional planar technology. The effect of the pillars is to confine the electric field in the lightly doped epi region. Due to this P-type pillar, the resistance of N-type epi can be reduced dramatically while maintaining the same level of breakdown voltage. In addition to low on-resistance characteristics, the second generation SuperFET® technology also achieves less stored energy in output capacitance as well. This energy value is more important in the case of small power applications, like LED lighting, because the energy needs to be dissipated at every switching-on instance. A 20W rated LED lighting power board is selected to evaluate the SuperFET® II technology. The power board was originally developed with Fairchild’s 60V N-channel MOSFET, the FDD5N60NZ and the FL7732 device. 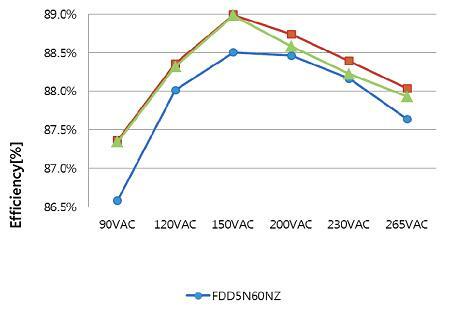 Among the major components, the FDD5N60NZ is a planar technology MOSFET with an on-resistance of 2O?. At the same cost, the SuperFET II technology can provide 0.9O? of on-resistance and less stored energy in output capacitance together. With these superior electrical characteristics, the SuperFET II technology can greatly boost system efficiency. Figure 2 demonstrates the efficiency test results with various AC inputs. The SuperFET II technology shows the best efficiency results over the entire input range and there is a large improvement as compared to planar technology of the FDD5N60NZ. The SuperFET II technology also recorded better efficiency than the competing super-junction MOSFET, especially at high-input voltage. This is a good example of how stored energy in output capacitance affects system efficiency. 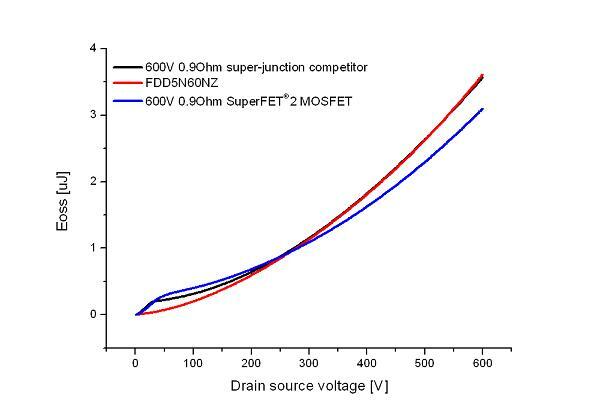 Because the competitor super-junction MOSFET has same on-resistance to the SuperFET II MOSFET, the gap in efficiency can be considered as coming from the switching losses. As shown in Figure 3, the competitor MOSFET holds more energy in output capacitance as drain-source voltage increases. This means this MOSFET is dissipating more power during switching-on at higher input voltage. In Figure 2, device level characteristics are well matched to board level test results. LED lighting power supply requires high- power factor, high efficiency, isolated secondary-side for safety standards, and less components due to limited space. 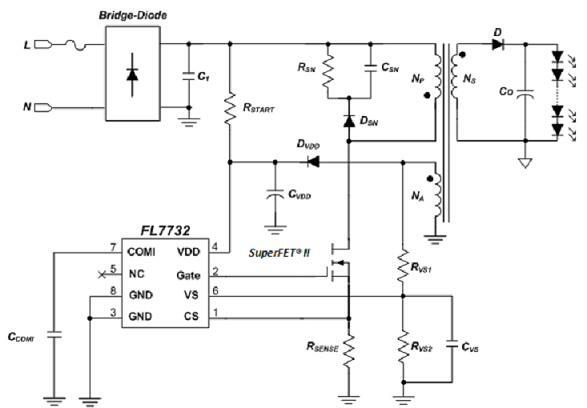 The FL7732 and SuperFET II MOSFET comprise a complete solution to these requirements.